Draft: 2014, Colorado Rockies, 8th rd. Harrison Scott Musgrave … resides in West Virginia during the offseason ... Son of Gary and Joyce … has two older brothers, Tyler and Preston, and a 10-year-old son named Alexander ... His brother Preston serves in the Navy ... In his free time, enjoys playing video games … favorite food is pepperoni rolls ... Attended West Virginia University and was named the Big 12 Pitcher of the Year in 2013. Made 35 relief appearances in his rookie season, including his Major League debut on April 23 vs. San Diego ... Had his contract selected from Triple-A Albuquerque April 23 and made his Major League debut that night vs. San Diego … pitched a scoreless inning with one strikeout ... Worked more than one inning 18 times, including a season-high three innings in his first Major League win, July 13 vs. Seattle ... Limited opponents to a .224 average (36-for-161) … lefties batted .217 (15-for-69), while right-handers batted .228 (21-for-92) ... Had one stint on the bereavement list (June 9-13) and one stint on the 10-day disabled list, July 14-24 (right hip flexor strain) ... Optioned to Albuquerque on Aug. 17 and returned Sept. 1 for his second stint on the roster … allowed runs in two of his 10 appearances in September (2.79 ERA) ... Appeared in two games in the NLDS vs. Milwaukee, allowing one run on one hit with three walks (one intentional) and two strikeouts in 0.2 innings pitched ... Made five relief appearances and three starts with Albuquerque, going 0-1 with a 5.40 ERA (16.2 IP, 10 ER). Made a career-low 12 starts with two stints on the disabled list ... Attended his first Major League Spring Training ... Began the season with Triple-A Albuquerque before being placed on the seven-day disabled list May 2 with right hip inflammation ... Was reinstated on May 26 and made seven more starts before fracturing a finger on his left hand that ended his season. Split the season with Double-A Hartford and Triple-A Albuquerque, going 13-8 with a 3.64 ERA (153.1 IP, 62 ER) between the two teams ... Went 5-1 with a 1.79 ERA (40.1 IP, 8 ER) in six starts with Hartford, before being promoted to Triple-A ... As a member of the Isotopes, went 8-7 with a 4.30 ERA (113.0 IP, 54 ER) over 19 starts … his 113.0 innings pitched were second on the team ... His 153.1 innings pitched were a career high. Began the season with High-A Modesto, where he went 10-1 with a 2.88 ERA (90.2 IP, 29 ER) before being promoted to Double-A New Britain ... While with New Britain, allowed more than three earned runs only once and pitched three consecutive scoreless starts from Aug. 16-27 ... Named the California League Pitcher of the Week for the week ending July 5, after pitching seven scoreless innings with one hit, no walks and eight strikeouts. Appeared in 13 games, including 11 starts, for Rookie Level Grand Junction in his first professional season ... Pitched three innings of scoreless, hitless relief in his professional debut, June 25 vs. Ogden ... Made his first professional start in his next appearance, June 30 at Orem, allowing eight runs, six earned, on seven hits with one home run, three walks and two strikeouts in 1.1 innings pitched. September 1, 2018 Colorado Rockies recalled LHP Harrison Musgrave from Albuquerque Isotopes. August 17, 2018 Colorado Rockies optioned LHP Harrison Musgrave to Albuquerque Isotopes. July 24, 2018 Harrison Musgrave roster status changed by Colorado Rockies. 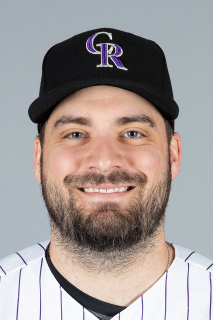 July 21, 2018 Colorado Rockies sent LHP Harrison Musgrave on a rehab assignment to Albuquerque Isotopes. July 14, 2018 Colorado Rockies placed LHP Harrison Musgrave on the 10-day disabled list. Right hip flexor strain. June 13, 2018 Colorado Rockies activated LHP Harrison Musgrave from the bereavement list. June 9, 2018 Colorado Rockies placed LHP Harrison Musgrave on the bereavement list. June 3, 2018 LHP Harrison Musgrave assigned to Albuquerque Isotopes. April 23, 2018 Colorado Rockies selected the contract of LHP Harrison Musgrave from Albuquerque Isotopes. January 29, 2018 Colorado Rockies invited non-roster LHP Harrison Musgrave to spring training. September 29, 2017 Albuquerque Isotopes activated LHP Harrison Musgrave from the 7-day disabled list. July 1, 2017 Albuquerque Isotopes placed LHP Harrison Musgrave on the 7-day disabled list. June 6, 2017 Albuquerque Isotopes activated LHP Harrison Musgrave from the temporarily inactive list. June 2, 2017 Albuquerque Isotopes placed LHP Harrison Musgrave on the temporarily inactive list. May 26, 2017 Albuquerque Isotopes activated LHP Harrison Musgrave from the 7-day disabled list. May 3, 2017 Albuquerque Isotopes placed LHP Harrison Musgrave on the 7-day disabled list retroactive to May 2, 2017. February 2, 2017 Colorado Rockies invited non-roster LHP Harrison Musgrave to spring training. May 20, 2016 LHP Harrison Musgrave assigned to Albuquerque Isotopes from Hartford Yard Goats. April 16, 2016 LHP Harrison Musgrave assigned to Hartford Yard Goats. February 11, 2016 Colorado Rockies invited non-roster LHP Harrison Musgrave to spring training. July 13, 2015 LHP Harrison Musgrave assigned to New Britain Rock Cats from Modesto Nuts. July 12, 2015 LHP Harrison Musgrave assigned to Modesto Nuts from New Britain Rock Cats. July 9, 2015 LHP Harrison Musgrave assigned to New Britain Rock Cats from Modesto Nuts. April 4, 2015 LHP Harrison Musgrave assigned to Modesto Nuts from Grand Junction Rockies. June 16, 2014 LHP Harrison Musgrave assigned to Grand Junction Rockies. June 15, 2014 Colorado Rockies signed LHP Harrison Musgrave.